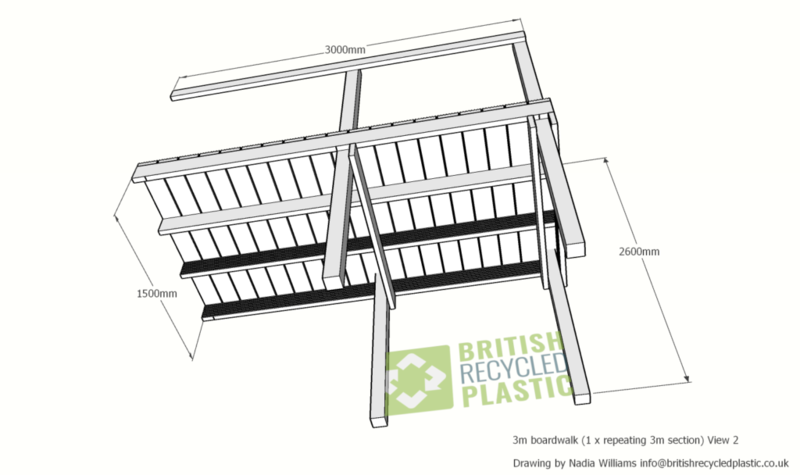 Our recycled plastic is commonly used for making a variety of different types of structures due to the fact that it is then virtually maintenance free. 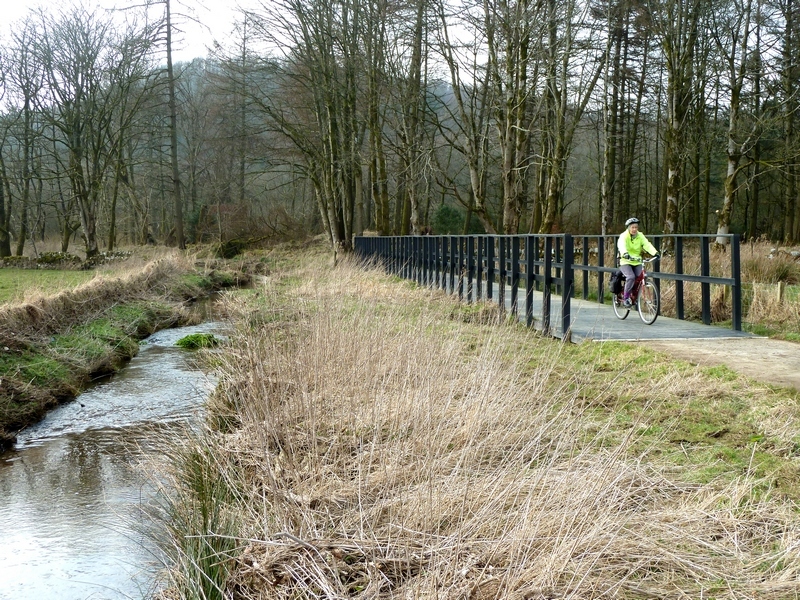 Some of the most common uses are walkways decked areas, fishing pegs, viewing and pond dipping platforms, boardwalks and cycleways, but this is by no means an exhaustive list. 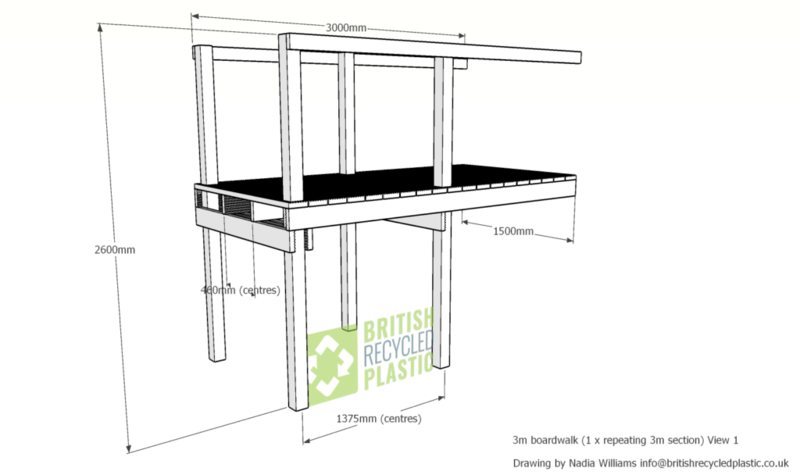 Achieving value for money is a key driver for any purchasing decision and, as our recycled plastic is completely rot-proof and splinter free, the “whole life” costs of recycled plastic are considerably lower than standard timber. 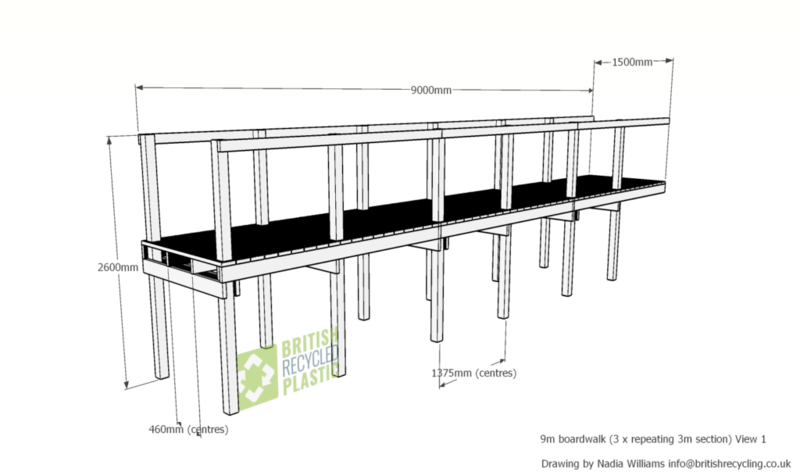 We have added a few of our drawings below as guidance for you and to help you understand how the material can be used to make structures, but you should always check your own calculations and build to your own specifications. Once they’ve been delivered, how do I store the boardwalk parts before I assemble them? 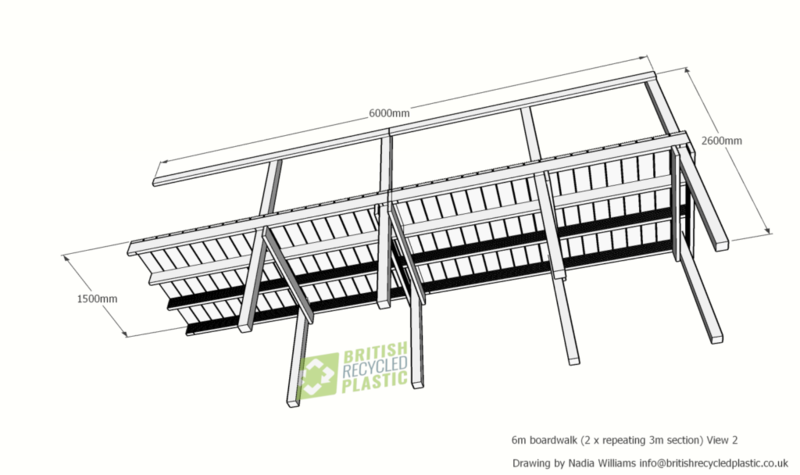 Recycled plastic boardwalk parts should always be stored laid flat on delivery, until you assemble them. What kind of tools to I need to use to work the recycled plastic? It can be cut and drilled like hardwood, but please be aware that this means you will go through blades and drill bits more quickly than if you were working with treated pine. For an elevated structure, what should I use for posts and how far apart should they be? We strongly recommend using 100x100mm posts (RPL005) spaced at a maximum of 1.5 metres apart, centre to centre. 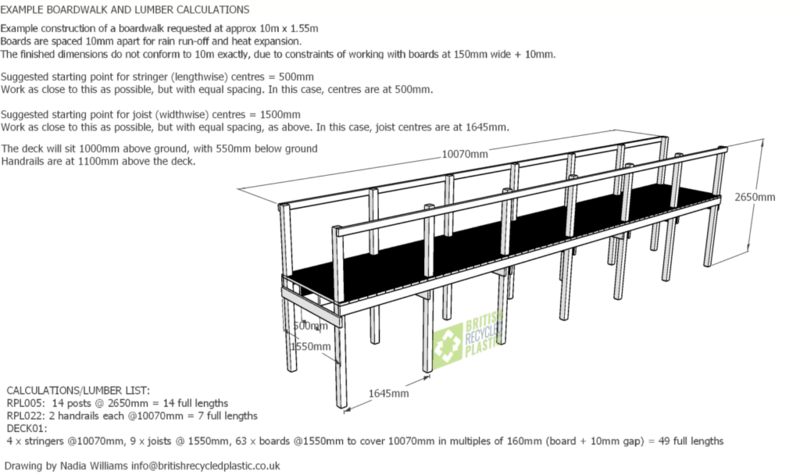 Can you calculate how many planks and of what size I need to make something if I give you the overall measurements? No, sorry. You will need to do your own workings out based on what you need and using our price and product list for the sizes. Can you supply planks cut to size? Yes, we can cut your material to your specified sizes for a small charge (see price list). Is there an easy way to work out how many decking planks I need to cover a surface? Allowing for a 10mm gap between boards, each decking plank can be roughly counted as half a square metre. How far apart do the stringers under decking planks need to be to create a surface that isn’t too springy? Do you have any drawings that I can use for guidance? We have a number of drawings you might like to look at here. Do the decking boards need to be laid in a particular direction? The grooves on the surface should always be laid across the direction that people will walk. Where used over water, the grooves should always be parallel to the bank. Can I screw directly into the recycled plastic? It is difficult and can be frustrating. We always advise drilling a pilot hole. 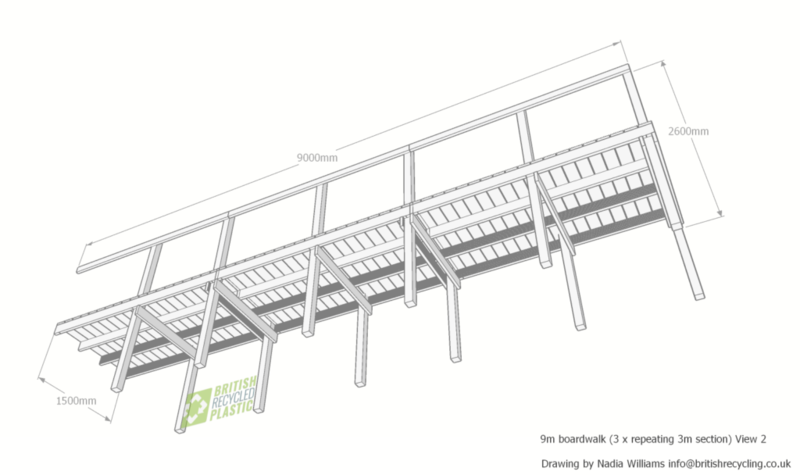 Can you give me a price to design and install a recycled plastic boardwalk? I’m afraid we don’t design and install ramps, platforms or boardwalks. We just manufacture and supply the boards. 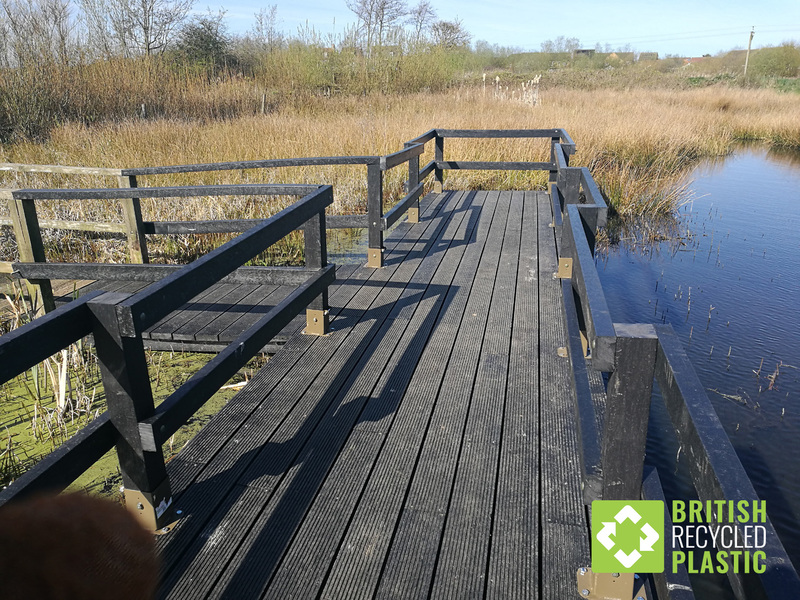 Our recycled plastic does, however, cut and perform in a similar manner to hardwood planks, so the people you would normally use to make this if it were wood should be able to construct it from recycled plastic. We would be happy to give you a price for the material and can cut it to size if you would like to supply a list of the planks you need. We are also happy to talk to any installers/joiners/volunteers on the phone if they would like additional support. The wooden boardwalk we have has rotted and become dangerous in under ten years. How long will yours last? We’d expect it to last several decades, probably 40-75 years if you build it well. What sort of fixings should I use? 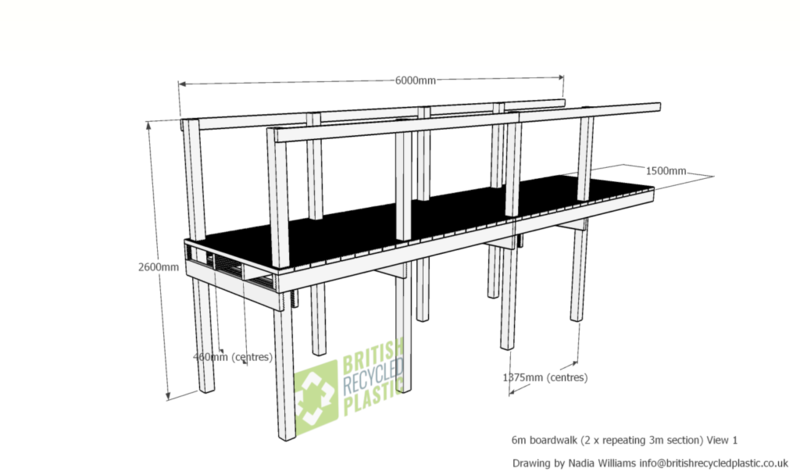 We would strongly recommend using stainless steel bolts and screws for any recycled plastic structure, whether boardwalks, platforms or anything else, otherwise the fixings will need replacing long before the planks, rails and posts. Non slip – The surface texture created in the manufacturing process produces a low slip risk surface and does not require the addition of chicken wire. Please see below for drawings with some suggested layouts for structures. While we have found these to work as general guidance tools, they are in no way a substitute for engineers’ or landscape architects’ drawings and you must make your own calculations for any structure you may wish to construct as Low Carbon Products Ltd cannot accept any liability for your design.